Investment in medium-sized enterprises can play a central role in building sustainable peace in Afghanistan. Previous research on local business and entrepreneurial investment in post-conflict communities support this claim. “How Enterprises Can Help Build Peace in Afghanistan” By Rabia Nusrat for Peacebuilding Deeply. July 30, 2018. 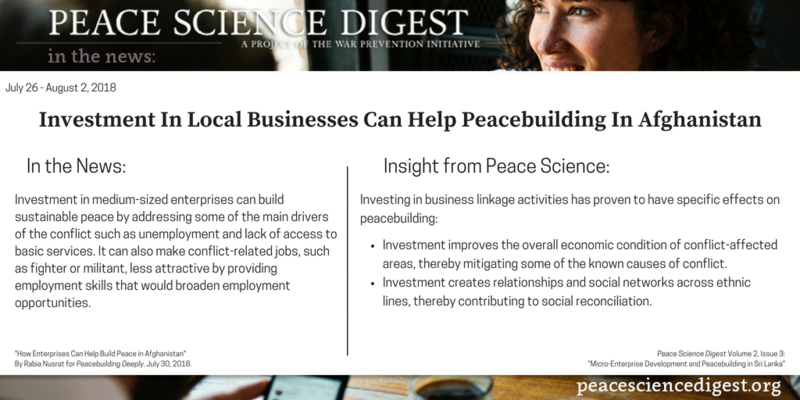 Peace Science Digest Volume 2, Issue 3: “Micro-Enterprise Development and Peacebuilding in Sri Lanka“.